Johnson Draw area, Wind River Canyon. View of erosion surface at top of the Madison Formation near Johnson Draw. Geologic notation: Pp: Permian Phosphoria Formation Pt: Pennsylvanian Tensleep Formation Pa: Pennsylvanian Amsden Formation Mm: Mississippian Madison Formation. This view is at 6.6 miles. The Madison Formation was deposited on a shallow marine water platform that was part of a large carbonate province located between zero and five degrees north paleolatitude. The platform was bounded on the north by the Central Montana Trough, by the intercratonic Williston Basin to the northeast, the Transcontinental Arch to the southeast, and the Antler Highlands to the west. Left: Paleography of North America in the Early Mississippian. 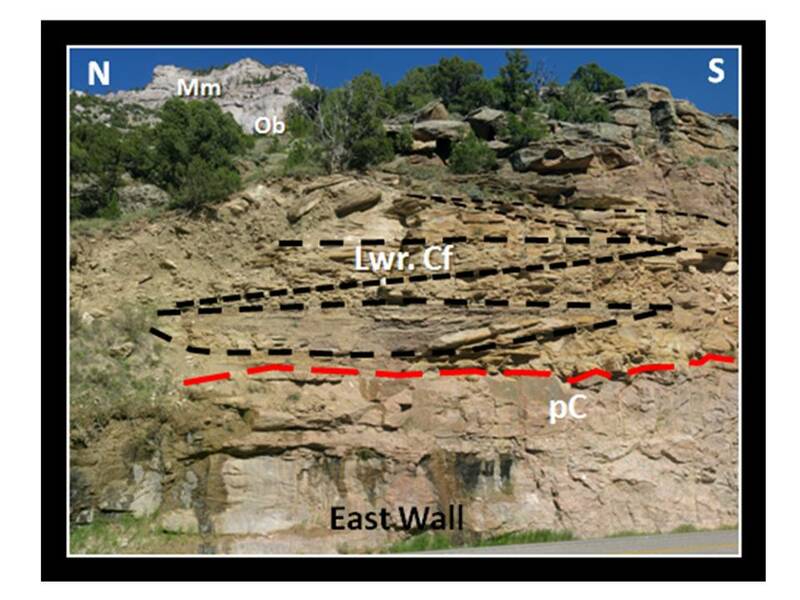 Right: Paleogeography of Mississippian Madison platform during deposition of the Little Tongue Member (Sequence IV) the uppermost unit present in Wind River Canyon. ​Images: Left: After Blakey, R., 2011, NAM_key-345Ma_EMiss, Key Time Slices of North America Geologic History DVD; Right: After Sonnenfeld, M. D., 1996, SEPM, Fig. 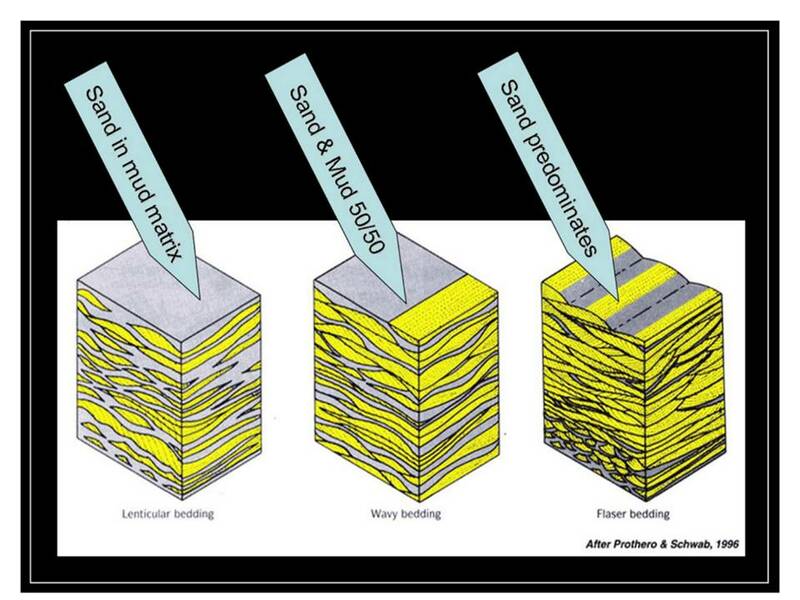 1, p. 167 (after Gutschick, Sandberg and Sando, 1980), in Moore, C. H., 2001, Carbonate Reservoirs, Developments in Sedimentology 55: Elsevier, Fig. 10.1, p. 342 (from CD). 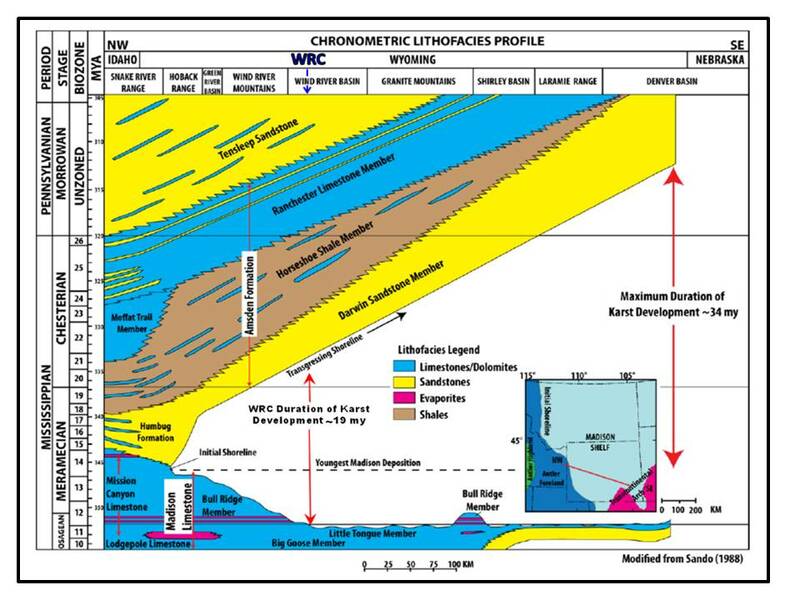 Regional time/lithology profile showing 19 million year duration of the Madison exposure in the Wind River Canyon (WRC). Madison Formation sequence stratigraphic column for the Bighorn/Wind River Basin. Right: Hamilton Dome subsurface log correlation to lithostratigraphic and sequence stratigraphic outcrop descriptions in southern Bighorn Basin. Cross section datum is the bottom of the regional solution zone at the base of Sequence IV (A Zone). The Madison Limestone post-depositional conversion to dolomite appears to depend on the original rock fabric. The finer grain rocks are preferentially dolomitized, which can increase the reservoir quality (porosity) of carbonates. The Middle to Late Ordovician Bighorn Dolomite forms the lowermost prominent carbonate cliffs in the Wind River Canyon. Thickness ranges from 85 to 140 feet. The formation was deposited in a regionally extensive tropical marine shelf environment that extended from Greenland to New Mexico. The lowest massive Steamboat Point Member is comprised of mottled light to medium gray and medium to coarse grained crystalline dolostone with locally abundant chert nodules. Incomplete dolomitization results in variable weathering producing the characteristically hackly weathered surface perpendicular to the stratification on outcrop (Kilsgaard et al., 1972). Cyclic bedding on a scale of about 1‐3 feet is visible from a distance and has been interpreted as the result of glacial‐induced sea level fluctuations. Ordovician Bighorn Formation. Left: Thickness map shows 0-edge about 25 miles south of Wind River Canyon (WRC). 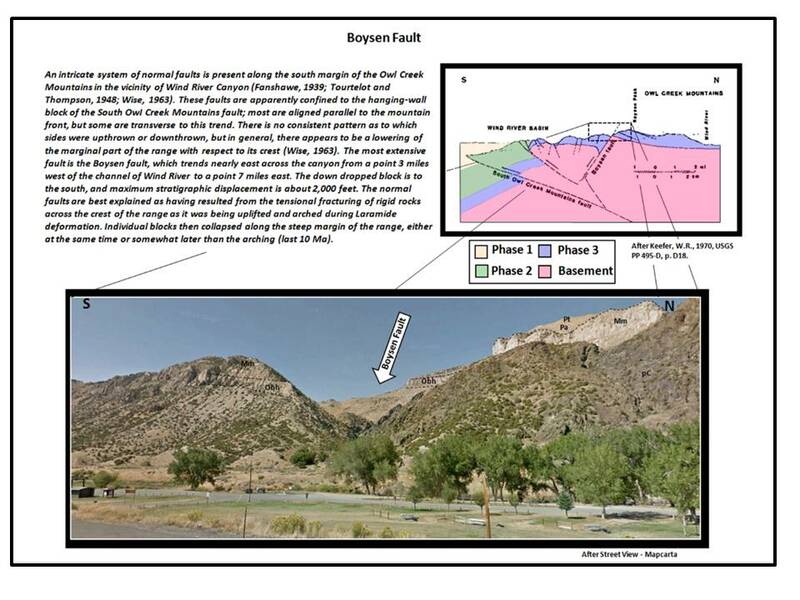 Right: Bighorn Dolomite outcrop cross section of from the Bighorn to Owl Creek Mountains. Images: Left: After Lynds, R. Campbell-Stone, E., Becker, T.P. and Frost, C.D., 2010, Stratigraphic evaluation of reservoir and seal in a natural CO2 field: Lower Paleozoic, Moxa Arch, southwest Wyoming: Rocky Mountain Geology, v. 45, Fig. 4, p. 118; Right: After Zenger, D.H. and LeMone, D.V., 1995, Widespread "Bighorn facies", Upper Ordovician, North America; in Cooper, J.D., Droser, M.L., and Finney, S.C. (eds. ), Ordovician Odyssey: Short Papers for the Seventh International Symposium on the Ordovician System, Pacific Section, SEPM, Book 77, Fig. 3, p. 390. Ordovician Bighorn Dolomite, Chimney Rock, Wind River Canyon. Chimney Rock is at 8.3 miles. 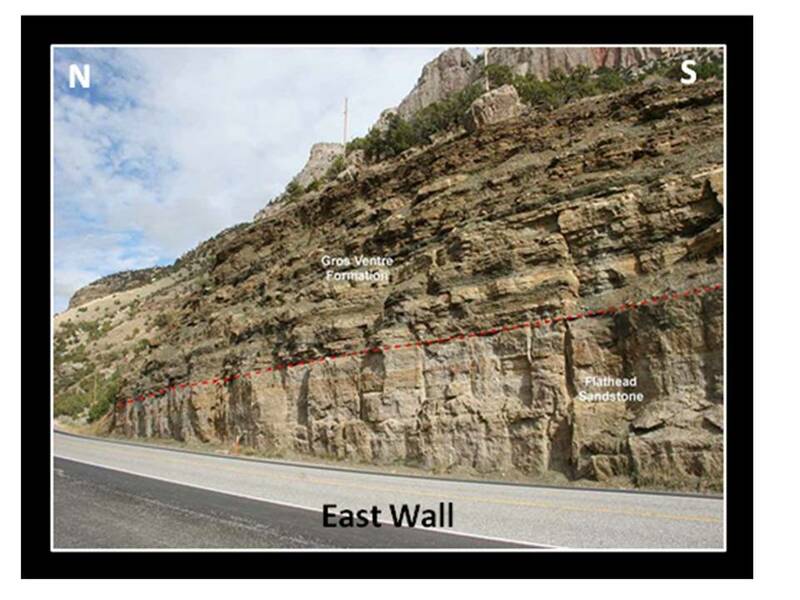 Ordovician Bighorn – Cambrian Gallatin contact on east wall and to southward in Canyon after sharp veer to the east (L/R) just past Teeter Canyon. Ob is Ordovician Bighorn and Cg is Cambrian Gallatin. View is at 8.5 miles. Left: Southwest view into Teeter Canyon. Right: Oblique north aerial view of geologic map near Teeter Canyon and Windy Point. Geologic notation: Pp: Permian Phosphoria Formation, Pt: Pennsylvanian Tensleep Formation, Pa: Pennsylvanian Amsden Formation, Pad: Ranchester Member of Pennsylvanian Amsden Formation, Pah: Horseshoe Member of Pennsylvanian Amsden Formation, Mm: Mississippian Madison Formation, Ob: Ordovician Bighorn Formation, Cg: Cambrian Gallatin Formation. Madison (Mm) and Bighorn (Ob) on skyline on west side of highway. Slopes are Cambrian Gallatin (Cg) and Cambrian Pilgrim Limestone (Cp). This view is at 12.2 miles. Back-limb thrust in Wind River Canyon. Fault is the result of a bedding plane detachment within the incompetent Cambrian shales in response to structural folding during Laramide mountain building. 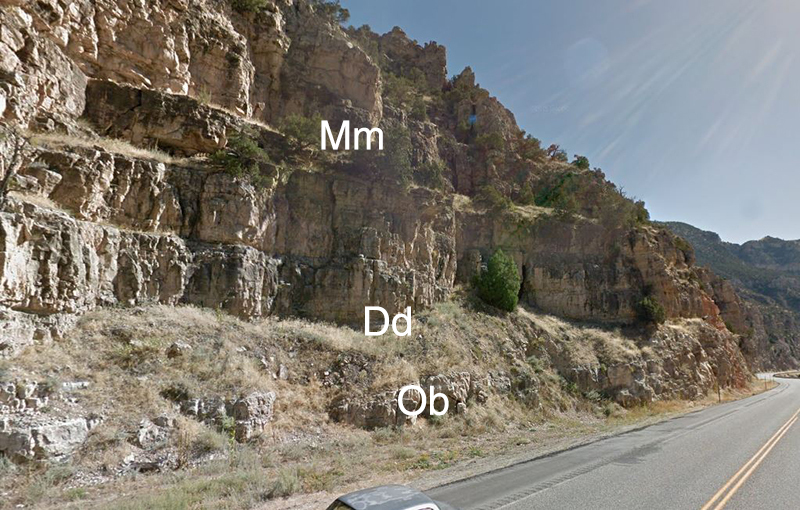 Geologic notation: Pa: Pennsylvanian Amsden Formation, Mm: Mississippian Madison Limestone, Obh: Ordovician Bighorn Dolomite, Cg: Cambrian Gallatin Formation, Cp: Cambrian Pilgrim Limestone Member of Gallatin Formation. ​Images: Steele, K.K., 2007, WRC Cp back-limb thrust fault. Contact of Cambrian Gros Ventre and Flathead Formations on east canyon wall. 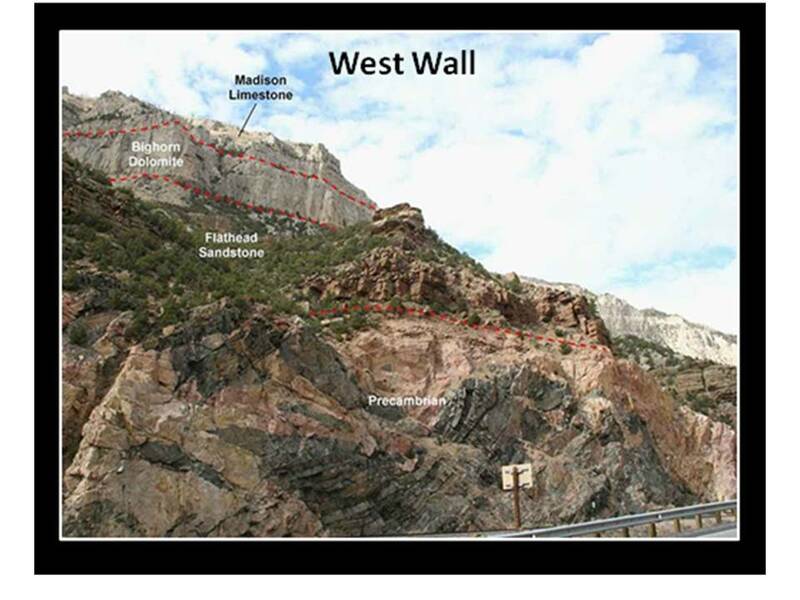 Channels developed in the cross bedded Lower Cambrian Flathead overlying Precambrian granite. Contact is red dashed line. Geologic notation: Mm: Mississippian Madison Limestone, Ob: Ordovician Bighorn Dolomite, Lwr. Cf: lower member of Cambrian Flathead Sandstone. ​The Flathead Sandstone represents the first record of Phanerozoic sedimentation as the Middle Cambrian (520-505 million years ago) seas began to flood Wyoming. The shoreline is oriented north-south. The thickness of the Flathead reflects the topography on the Precambrian unconformity. ​The Flathead is separated into a basal conglomerate and feldspathic sandstone deposited by braided streams, a deltaic flat-laminated feldspathic sandstone with shaley layers and a hummocky and cross-bedded feldspathic sandstone. The quartz and feldspar mineral components of the sands were sourced from Precambrian granitic bedrock. Flathead depositional model and paleocurrent data. Wind River Canyon (WRC) location shown by red dot. ​Images: Left: After Middleton, L.D., 1980, Sedimentology of middle Cambrian Flathead sandstone, Wyoming PhD Dissertation, University of WY, Fig. 2.21, p. 71; Right: After Ibid., Fig. 2.22, p.72. Younger pink granite pegmatite intruding into Archean-age black schist and amphibolite, that were originally sediments and extrusive basalts deposited in the Sweetwater trough. This ancient trough developed at the margin of the Wyoming craton almost 3 billion years ago. It marks the suture between subprovinces within the craton. Hand samples of the Wyoming craton. Precambrian remnant pillow structure in Archean amphibolite. Site is about 250 feet of tunnel number 1. The pillow structure indicates the original lava was deposited in water. West view of the Boysen Normal Fault from Lower Wind River Campground. Boysen residence was located in this area. ​Images: Cross section: After Keefer, W.R., 1970, USGS PP 495-D, p. D18; Bottom: After Mapcarta Street View. 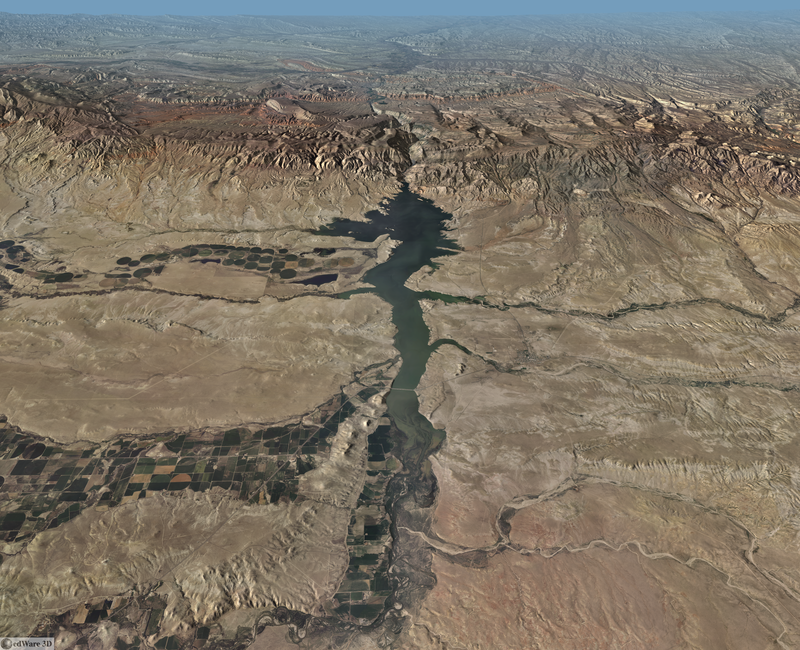 ​The original Boysen Dam was located across the canyon on the upthrown side of Boysen Fault. The dam was constructed in 1908. Asmus Boysen envisioned a source of water and power for nearby mining operations. But events did not work out for his dam. Electricity was delivered to the mines, Shoshoni and Riverton beginning in 1911, but the railroad had begun legal proceedings against the power company in 1908. The 1915 Wyoming Supreme Court ruling required removal of the dam’s super structure and made power generation unprofitable. The 1923 flood silted the plant generations and that ended its short existence. Mining activity slowed, more lawsuits arose and flooding continued to plague the railroad line in the canyon. After numerous legal battles the dam was finally removed in 1948 as part of constructing the new dam. Some of the abutments from the old dam can still be seen on the canyon walls on the south side of tunnel #3. The land upon which the upper and lower campgrounds are located was created by siltation from flooding. The new dam was completed in 1953. Top Right: South aerial view of Boysen Dam area. Bottom Right View of original Boysen Dam, 1908. Top Right: Tourist facilities on the east side of highway just after Tunnel #3. Bottom Right: Old comfort station located near the bar and café. Image: After Granath, J.W., 1975, Precambrian Research, Fig. 2, p. 3. Cross sections in area of Boysen structural complex. ​Images: After Wise, D.U., 1963, AAPG Bulletin Vol. 47, No. 4, Fig. 4, p. 592; Bottom Right: After Lageson, D. and Spearing, D., 1988, Roadside Geology of Wyoming, 2nd Ed. 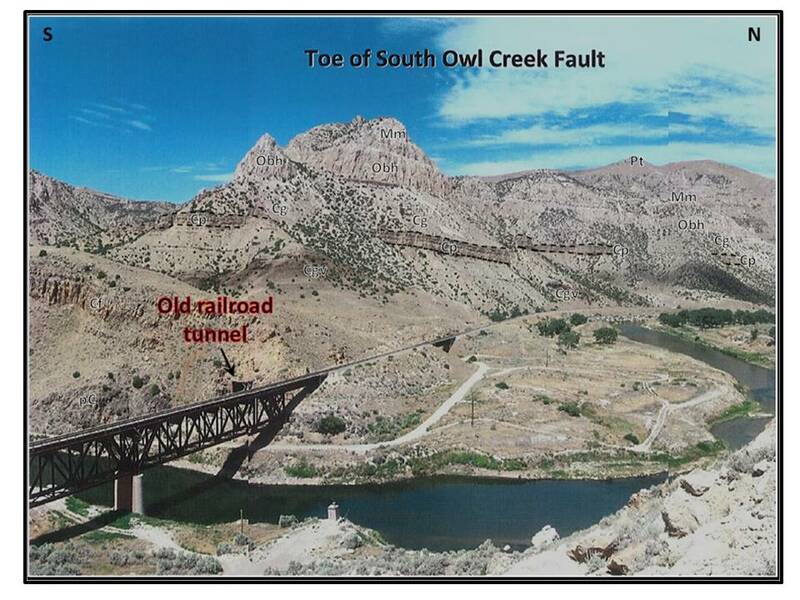 Structure of the East Owl Creek Arch (EOCA) and the South Owl Creek Fault. Images: Upper Left: After Blackstone, D.L., Jr., 1990, Rocky Mountain Foreland Structure Exemplified by the Owl Creek Mountains, Bridger Range and Casper Arch, Central Wyoming: WGA, Cross Section 14; Upper Left: After Molzer, P.C. 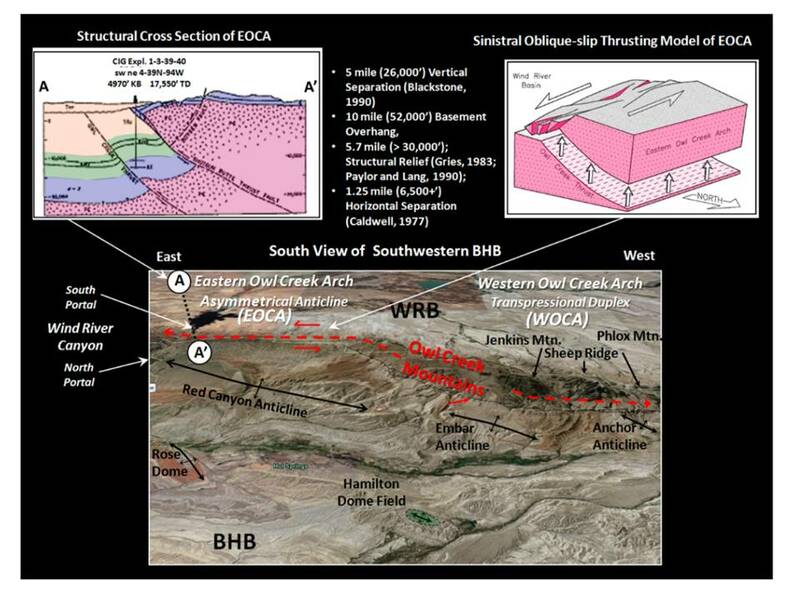 and Erslev, E.A., 1995, Oblique Convergence During Northeast-Southwest Laramide Compression Along the East-West Owl Creek and Casper Mountain Arches, Central Wyoming: AAPG Bulletin, Vol. 79, No. 9, Fig. 16, p. 1393; Bottom: Google Earth. The Wind River Canyon is on the Wind River Indian Reservation, so public access in the Canyon is restricted to the pullouts next to the highway. Our recommendations for fun things to do include fishing & rafting, and visits to Anchor Dam, Dinosaur Marbles, Thermopolis Hot Springs and the Wyoming Dinosaur Center. Fishing & Rafting – You can fish the river in the Canyon from the shore with a Wind River Tribal Fishing/Trespass Permit and the annual Recreation Stamp which you can buy in Thermopolis. 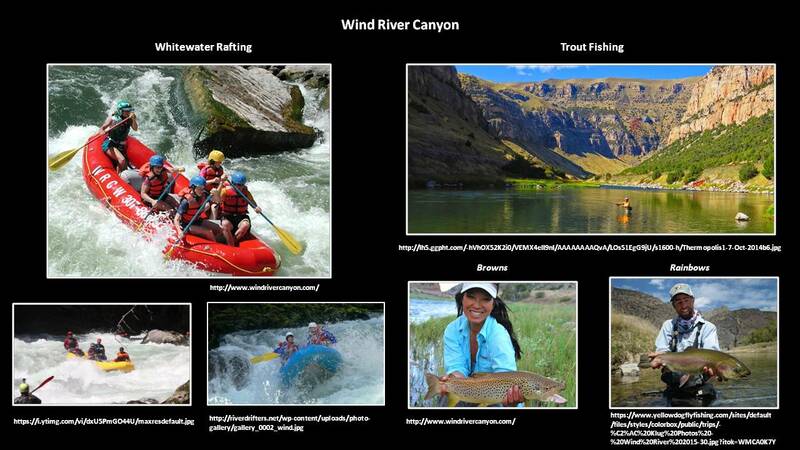 Another option is guided whitewater rafting and fishing trips in the Canyon run by Wind River Canyon Whitewater & Fly Fishing also located in Thermopolis. Just north of the Canyon and north of the Reservation, starting at the Wedding of the Waters public access, you can float and/or fish the Big Horn River. From Wedding of the Waters to Thermopolis, the river is flanked by private land, thus you will need a boat/raft or a guided trip to access this stretch. Inquire in town about river takeout options, river flows, and hazards which include low bridge clearance. Fishing this section requires a Wyoming Game & Fish license which you can also buy in Thermopolis. 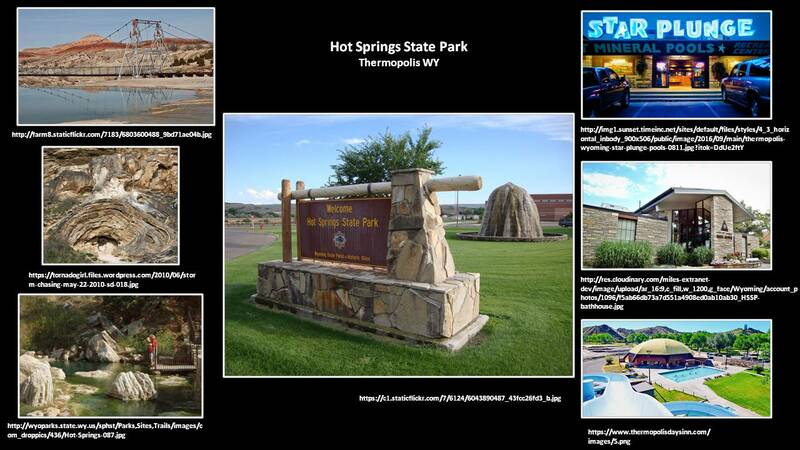 Hot Springs State Park – Within the state park there are trails to the river, springs, terraces, and overlooks. There is the State Bath House and two hot mineral water commercial swimming facilities at Hellie’s Tepee Pools and Star Plunge. 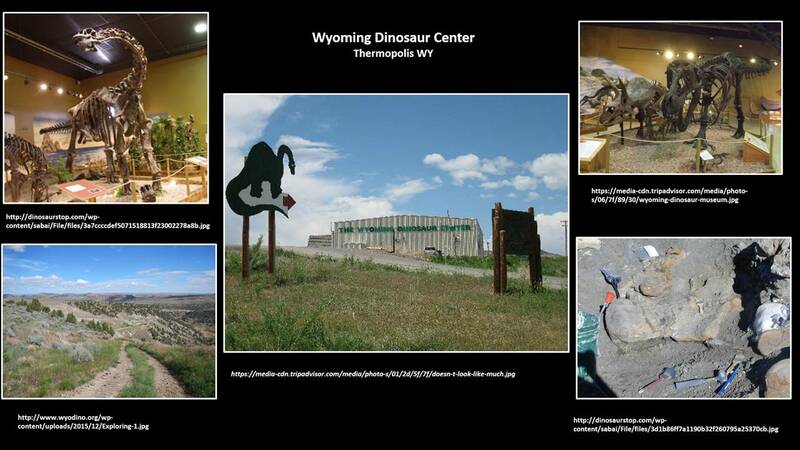 Wyoming Dinosaur Center – In addition to dinosaur exhibits and the bone preparation lab, they have a fine museum with a wide variety of fossils over geologic history displayed in a “Walk Thru Time”. From late-May through mid-September, they offer tours of the dig site and a “Dig For A Day” program where you can help them dig in the dinosaur bone beds.